The legs of beetles help them to walk, run, swim, and dig. All beetles have six legs. Each leg is made out of several parts. Each leg ends in two to five small segments called tarsi. The last tarsus (the singular of tarsi) of each beetle “foot” has one or two claws on the end of it. Most beetles use their legs to walk or run. Some beetle legs are flat and have long hairs on them. These kinds of legs are found on water beetles. 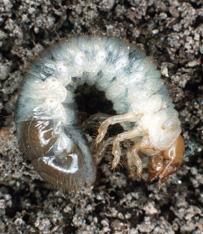 Beetles that often dig in soil have flat legs with spines or horns at the edges. Flat legs with horns are called fossorial legs. A few beetles have large hind legs, similar to those of grasshoppers, which help the beetle to jump. Flea beetles are an example of jumping beetle. In 2009, a fossil beetle was found in the Pennsylvanian of Mazon Creek, Illinois. This put the origin of the beetles back to 318 to 299 mya. Fossils from this time have been found in Asia and Europe, for instance in the red slate fossil beds of Niedermoschel near Mainz, Germany. Other fossils have been found in Obora, Czech Republic and Tshekarda in the Ural Mountains, Russia. The first discoveries from North America in Oklahoma were published in 2005 and 2008. After the Permian–Triassic extinction event, the fossil record of insects is poor, but there are some beetles from the Lower Triassic. At the Babiy Kamen site in the Kuznetsk Basin, there are many beetle fossils, including entire specimens of the infraorders Archostemata (e.g. Ademosynidae, Schizocoleidae), Adephaga (e.g., Triaplidae, Trachypachidae) and Polyphaga (e.g. Hydrophilidae, Byrrhidae, Elateroidea). During the Jurassic (210 to 145 mya), there was a dramatic increase in the number of beetle families, including the development and growth of carnivorous and herbivorous species. Dung beetles, and herbivorous beetles living on conifers, were common in the Jurassic period. The evolution of flowering plants in the Cretaceous led to the vast numbers of beetle species there are today. Archostemata: Archostemata is the smallest suborder of beetles, consisting of fewer than fifty known species in five families. Archostemata is an ancient lineage with a number of primitive characteristics. They are similar in morphology to the first beetles, which appear in the fossil record about 250 million years ago. Pakaluk J. & Slipinski S.A. eds 1995. 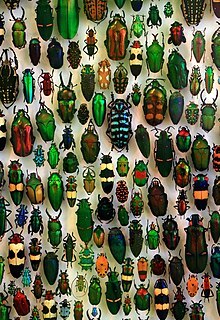 Biology, phylogeny, and classification of Coleoptera: papers celebrating the 80th birthday of Roy A. Crowson. Muzeum i Instytut Zoologii PAN, Warszawa. ↑ Arthur D. Chapman (2009). Numbers of living species in Australia and the world (PDF) (2nd ed.). Department of the Environment, Water, Heritage and the Arts. ISBN 978-0-642-56861-8. ↑ Gullan P.J. & P.S. Cranston (2010). The Insects: an outline of entomology (4 ed.). Oxford: Wiley. ISBN 1-444-33036-5. ↑ Kukalová-Peck, J. & Lawrence J.F. (1993). "Evolution of the hind wing in Coleoptera". Canadian Entomologist 125 (2): 181–258. doi:10.4039/Ent125181-2. ↑ Hörnschemeyer, T.; Stapf H.. "Die Insektentaphozönose von Niedermoschel (Asselian, unt. Perm; Deutschland)" (in German). Schriften der Alfred-Wegener-Stiftung (99/8): 98. ↑ Kukalová J. (1969). "On the systematic position of the supposed Permian beetles, Tshecardocoleidae, with a description of a new collection from Moravia". Sborník Geologických Věd, Paleontologie 11: 139–161. ↑ 9.0 9.1 Benisch, Christoph (2010). "Phylogeny of the beetles". The beetle fauna of Germany. Kerbtier. Retrieved March 16, 2011. ↑ Beckemeyer, R.J.; Engel M.S. (2008). "A second specimen of Permocoleus (Coleoptera) from the Lower Permian Wellington Formation of Noble County, Oklahoma". Journal of the Kansas Entomological Society 81 (1): 4–7. doi:10.2317/JKES-708.01.1. Archived from the original on July 18, 2011. https://web.archive.org/web/20110718202310/http://fossilinsects.net/pdfs/beckemeyer_engel_2008_JKansEntSoc_PermocoleusPermOklahoma.pdf. ↑ Shcherbakov D.E. (2008). "On Permian and Triassic insect faunas in relation to biogeography and the Permian-Triassic crisis". Paleontological Journal 42 (1): 15–31. doi:10.1007/s11492-008-1003-1. https://www.researchgate.net/publication/227293773. ↑ Ponomarenko, A.G. (2004). "Beetles (Insecta, Coleoptera) of the Late Permian and Early Triassic". Paleontological Journal 38 (Suppl. 2): S185–S196. Archived from the original on November 11, 2013. https://web.archive.org/web/20131111123220/http://palaeoentomolog.ru/Publ/PALS185.pdf. This page was last changed on 13 March 2019, at 17:02.